Summer is made for candy. Whether you’re buying for a movie theater, selling candy for a summer fundraiser while school is out or just want to keep boxes of candy at home (your secret’s safe with us), The Wholesale Candy Shop has you covered. These movie theater candy brands are sure to be a smash this summer! You don’t have to be Violet Beauregarde or Veruca Salt to go crazy over Wonka candy. Colorful Gobstoppers (classic or chewy), fruit-shaped Runts and impossibly tiny Nerds are movie theater bestsellers. Laffy Taffy’s many flavors are just as bright and summery as the boxes they come in. These bright, fun to share candies pair well with family movies and peals of laughter. 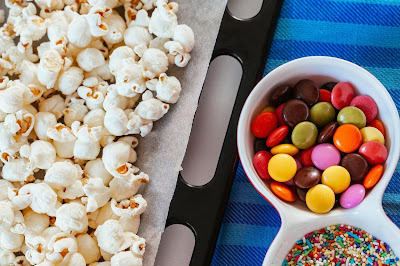 Next time you’re planning a family movie night, you could take them on a candy-eating Spree (see what we did there?). Fun Fact: Chocolate can’t melt in your hand if you eat it fast! Junior Mints offer a crisp, cooling burst of mint nestled in a shell of soft, sweet chocolate. For a crunchier chocolate treat that also has the added benefit of a cool refresher, you can’t go wrong with pouring M&M’s all over a bowl of ice cream. M&M’s also go great in cookies, blondies and other baked goodies for summer cookouts. Speaking of cookies, Chocolate Chip Cookie Dough Bites are the perfect treat for your next girls’ night in. Enjoy all the sweet, gooey goodness of cookie dough without worrying about raw egg. The malted flavor of Sixlets is a childhood classic. If you’ve never had a contest to see which of your kids (or your friends) can eat the most sour candy, you’re in for a hilarious challenge. Many people pucker up every time the name “Lemonheads” is even mentioned! Atomically flavor-packed Sour Warheads are sure to get a big reaction out of even the most seasoned sour candy connoisseur. And we’d be just plain silly not to include Sour Patch Kids in the mix. For an exciting twist on another popular summer family challenge, why not participate in a watermelon contest using Sour Patch Watermelon candy? What could be better on a hot summer day than a juicy burst of fruit-flavored candy? The tropical flavors of Starburst and Dots give you a dose of an island vacation whether you’re cooling off in a movie theater or hanging out by the pool. Summer throwback Swedish Fish are available in assorted flavors. It’s a little-known fact that Twizzlers make great straws. Give it a try next time you’re at the movies this summer! What are your favorite movie theater candies? Share your stories in the comments section below. We’d love to hear from you!